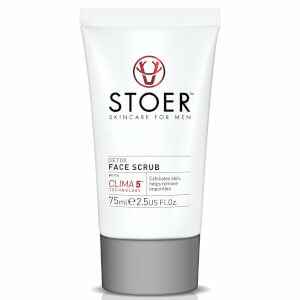 Improve your skin's overall appearance with the Detox Face Scrub from Stoer Skincare, a Scottish brand that creates high-performance, easy-to-use grooming products for men. 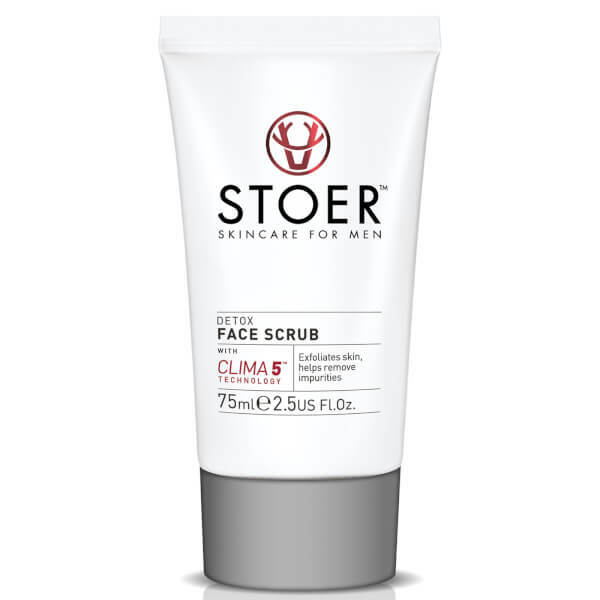 Powered by a trio of natural, mineral and volcanic exfoliants, the face scrub effectively buffs away dead skin and pore-clogging impurities, without over-drying or uncomfortable tightness. Innovative Clima5™ Technology (a unique blend of five skin-saving plant actives from four very different, individually challenging climates) defends against stress, pollution and shaving irritation for long-lasting comfort. Gently massage into damp skin on the face and neck using gentle circular motions, avoiding the delicate eye area. Rinse off thoroughly. For dry/normal skin apply 1-2 times a week. For oily skin or skin prone to ingrown hairs, use every other day. Can be used before shaving to lift stubble in readiness for cutting. Aqua (Water), Caprylic/Capric Triglyceride, Hydrated Silica, Glycerin, Polyglyceryl-3 Methylglucose Distearate, Cetearyl Alcohol, Glyceryl Stearate SE, Hydrogenated Coco-Glycerides, Hydrogenated Vegetable Oil, Prunus Amygdalus Dulcis (Sweet Almond) Oil, Avena Sativa Kernel Flour, Avena Sativa Kernel Oil, Benzyl Alcohol, Parfum (Fragrance), Silica, Sclerotium Gum, Xanthan Gum, Sucrose Laurate, Propanediol, Undaria Pinnatifida Cell Culture Extract, Isomalt, Allantoin, Dehydroacetic Acid, Phytic Acid, Opuntia Ficus-Indica Stem Extract, Polypodium Vulgare Root Extract, Hydrolyzed Adansonia Digitata Extract, Leuconostoc/Radish Root Ferment Filtrate, Phenoxyethanol, Cetraria Islandica Extract, Sphagnum Magellicanum Extract, Lecithin, Saponaria Pumila Callus Culture Extract, Citric Acid.